Part 1 Current practices: Current practices in condition assessment of aged ships and floating offshore structures; Current practices in condition assessment of aged fixed-type offshore structures; Definition and assessment of deficiencies in building construction. 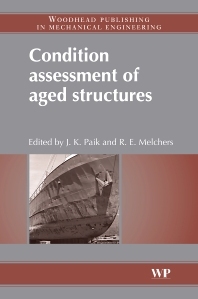 Part 2 Mechanisms, mathematical models and preventive measures for age-related deterioration: Corrosion wastage in aged structures; Fatigue cracking in aged structures; Local denting and other deterioration in aged structures. Part 3 Residual strength of aged structures: Corroded structures and residual strength; Cracked structures and residual strength; Dented structures and residual strength. Part 4 Reliability of aged structures: Reliability of aged ship structures; Reliability of aged offshore structures; Reliability of aged land-based structures. Part 5 Inspection and maintenance: Inspection of aged ships and offshore structures; Inspection of aged land-based structures; Maintenance of aged ships and offshore structures; Maintenance of aged land-based structures; Risk-based inspection and maintenance of aged structures. Professionals from a broad range of disciplines will be able to gain a better understanding of current practices and standards for structural condition assessment or health monitoring, and what future trends might be. Jeom Kee Paik BE, ME, Dr Eng is Professor of Ship and Offshore Structural Mechanics at Pusan National University, Korea and Director of the University’s LRET (Lloyd’s Register Educational Trust) Research Centre of Excellence. His main areas of teaching and research are non-linear structural mechanics in association with limit states and risk-based design and assessment of ships and offshore structures. Robert E. Melchers BE, MEngSc, PhD is a Fellow of the Australian Academy of Technological Sciences and Engineering, and an Australian Research Council Professorial Fellow. He has been Professor of Civil Engineering at the University of Newcastle, Australia since 1986, where his main areas of research and consulting are the risk and reliability assessment of complex structures and systems, and structural deterioration, including corrosion.